The first backcross of SweetChunk F1 to her mother, the sweet pink grapefruit, brought a surprising result. The small splitting into several phenotypes in this backcross was seen previously. However, the overall picture of all plants are very close to the original SPG clone. For this cross we selected many SweetChunk F1 plants and save two very good Male`s. At the end we decided us for a more Sativa and SPG dominant Male and did a backcross to the Sweet Pink Grapefruit clone. The growth of the first Backcross is in contrast to the Sweet Chunk F1 Generation more similar to the leaf shape much finer and more delicate. Also, the extension is no longer compare with the F1 hybrid. The whole plant form has changed and tends more to a similar growth like the SPG. The Sweet Chunk F1 hybrid was characterized by the dominance of the Deep Chunk which makes the cross very homogeneous and stable. Through the first backcross, there was a previously suspected splitting of the genes and hence also to more phenotypes in a Seedpack, where in all plants from the same overall picture forth the sweet pink grapefruit. There are three different phenotypes. 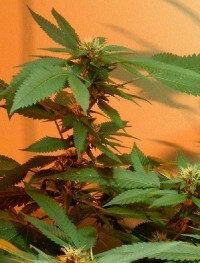 One Deep Chunk pheno which is similar to the Sweet Chunk F1, with a lot of resin, compact buds and an more Indica look. The flavor from this Deep Chunk pheno is more hashy with a little fruity smell. The second pheno is an identical copy of the Sweet PinkGrapefruit Clone; a more sativa dominant growth, thick inflorescence and an intense smell - a perfect copy of Sweet Pink Grapefruit. The third and final phenotype has the same flavor as pheno two, but a little bit more Sativa dominant and needs to mature for a few days longer. The smell and taste can be easily compared with the second SPG phenotype but a little berry impact can be noticed too. 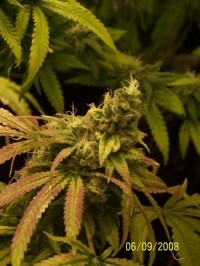 The effect has evolved from a typical Indica Sativa hybrid with a similar stoned, up high. Also, the yield has improved and is now comparable to that of the SPG.